The power system is comprised of various elements such as generator, transformer, transmission lines, bus bars, circuit breakers, isolators etc. Now we will discuss in brief about these elements. The generator or alternator is the important element of power system. It is of synchronous type and is driven by turbine thus converting mechanical energy into electrical energy. The two main parts of generator are stator and rotor. The stationary part is called stator or armature consisting of conductors embedded in the slots. The conductors carry current when load is applied on the generator. The rotating part or rotor is mounted on the shaft and rotates inside the stator. The winding on rotor is called field winding. The field winding is excited by d.c. current. This current produces high m.m.f. The armature conductors react with the m.m.f. produced by the field winding and e.m.f. gets induced in the armature winding. 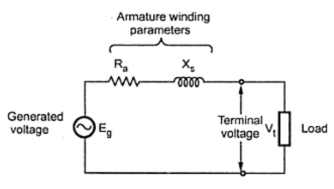 The armature conductors carry current when the load is connected to an alternator. This current produces its own m.m.f. This m.m.f. interacts with the m.m.f. produced by the field winding to generate an electromagnetic torque between stator and rotor. The d.c. current required for field winding is supplied through exciter which is nothing but a generator mounted on the same shaft on which alternator is mount. 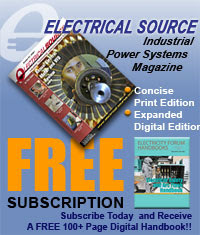 The separate d.c. source may also be used sometimes to excite the field windings through brushes bearing o slip rings. The generators are driven by prime mover which is normally a steam or hydraulic turbine. The electromagnetic torque developed in the generator while delivering power opposes the torque provided by the prime mover. With properly designed rotor and proper distribution of stator windings around the armature, it is possible to get pure sinusoidal voltage from the generator. This voltage is called no load generated voltage or generated voltage. The representation of generator is shown in the Fig. 1. 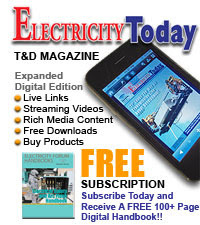 For stepping up or down the system voltage, power transformers are used in the substations. At generating end, the voltage is only stepped up for transmission of power while at all the subsequent substations the voltage is gradually stepped down to reach finally to working voltage level. Instead of using a bank of 3 single phase transformers, a single three phase transformer is used nowadays. The advantages of using this transformer is the easiness in its installation and only one three phase load tap changing mechanism can be used. Generally naturally cooled, oil immersed, two winding, three phase transformers upto the rating of 10 MVA are installed upon lengths of rails fixed on concrete slabs having foundations 1 to 1.5 m deep. For more than 10 MVA ratings, forced oil, water cooling and air blast cooling type may be used. The tap changers are used for regulating the voltage of transformers. The transmission line forms the connecting link between the generating stations and the distribution systems. It carries the power generated by generating stations and makes it available for distribution through distribution network. Any electrical transmission line has four major parameters which are important from the point view of its proper operation. These parameters are namely resistance, inductance, capacitance and conductors. The resistance and inductance is uniformly distributed along the line. It forms series impedance. The resistance of a line is responsible for power loss. It is expected that the resistance of a line should be as low as possible so that the transmission system will be more efficient. Due to linkage, the conductor is associated with inductance which is distributed along the length of the line. For analysis, both resistance and inductance are assumed to be lumped. The capacitance also exists between the conductors and is the charge on the conductors per unit of potential difference between them. The conductance between conductors or between conductors and the ground is due to leakage current at the insulators of overhead lines and through the insulation of cables. The leakage at conductors is negligible so the conductance between conductors of an overhead line is taken as zero. The conductance and capacitance between conductors of a single phase line or from conductor to neutral of a three phase line form the shunt admittance. Depending upon the length of the transmission line it is classified as short transmission line, medium transmission line and long transmission line. For short line, its length is small so capacitance effects are small and are neglected. Bus bars are the common electrical component that connect electrically number of lines which are operating at the same voltage directly. These bars are of either copper or aluminium generally of rectangular cross-section. They can be of other shapes such as round tubes, round solid bars or square tubes. The outdorr bus bars, pipes are used. The pipes are also used for making connections among different components. The pedestal insulators support the bus bars and the connections. The equipments and bus bars are spared out and it requires large space. The clearance remain constant s the bus bars are rigid. 1) The maintenance is easy as bus bars and connections are not very high from ground. 2) As pipe diameter is large, the corona loss is less. 3) Reliability is more than strain type. 1) Larger area is required. 2) It requires comparatively high cost. In strain type, bus bars are an overhead system of wires between two supporting structure and supported by strain type insulators. As per the size of the conductor, the stringing tension can be limited (500 - 900 kg). The advantage of this type is its economy and its recommended presently due to general shortage of aluminium pipes. The material used in case of rigid type bus bars is aluminium pipes. The general sizes of pipes commonly used for voltage are as given below. Due to rapid oxidization of aluminium, proper care must be taken while doing connections. In order to avoid strain of supporting insulators due to thermal expansion or contraction of pipe, joints should be provided. In case of strain type arrangement, material used is ACSR (Aluminium conductors with steel reinforcement) and all aluminium conductors. For high ratings of bus bars bundled conductors are used. The commonly used sizes are as below. The circuit breakers are used to open or close a circuit under normal and faulty conditions. It can be designed in such a way that it can be manually operated or by remote control under normal conditions and automatically operated during fault. For automatic operation, relay circuit is used. The circuit breakers are essential as isolators cannot be used to open a circuit under normal conditions as it has no provision to quench arc that is produced after opening the line. It has perform following functions. i) Full load current is to be carried continuously. ii) Opening and closing the circuit on no load. iii) Making and breaking the normal operating current. iv) Making and breaking the fault currents of magnitude upto which it is designed for. Upto 66 KV voltages, bulk oil circuit breaker are used. Voltages greater than 66 KV, low oil circuit breaker are used. For still high voltages, air blast, vacuum or SF6 circuit breakers are used. In order to disconnect a part of the power system for maintenance and repair purposes, isolating switches are used. These are operated after switching off the load by means of a circuit breaker. The isolators are connected on the both sides of circuit breakers. Thus to open isolators, circuit breakers are to be opened first. An isolator is essentially a knife switch and is designed to open a circuit under no load that is lines in which are connected should be carrying any current. Use of isolators in a substation is shown in the Fig. 2. As shown in thew Fig. 2, there are 5 sections. With the help of isolators, each section can be disconnected for repair and maintenance. If it is required to do maintenance in section 4, then the circuit breaker in that section is to be opened first and then open the isolator 3 and 4. Thus section 4 is open for maintenance. After maintenance, the isolators 3 and 4 are to be closed first and then circuit breaker is closed. In some cases, isolators are used as circuit breaking devices. But it is limited by particular conditions such are power rating of given circuit. The isolators are of two types viz single pole and three pole isolators.